As the second largest patient advocacy group for CFIDS/ME patients in the U.S., the National CFIDS Foundation's primary responsibility and allegiance is to the worldwide patient community. It has long been our goal to find answers to this disease aimed at causation and treatment. Towards this end, the NCF has spent approximately $1.3 million dollars over the last ten years to direct innovative research, via our established grant program, to assist us with our scientific probing. While reviewing the recent medical literature, NCF staffers came across a most interesting direct connection between CFIDS/ME and ionizing radiation. This connection revolves around a world reknown CFIDS/ME physician and the current research undertaken by his son. Both are directly connected to a former U.S. government radiation expert. David S. Bell, MD is a graduate of Harvard University, class of 1967, with an AB degree in English Literature. He graduated in 1971 from the Boston University School of Medicine with an MD degree, and in 1976 completed post-doctoral training in pediatrics including Pediatric Behavior and Developmental Disorders . Dr. David Bell was involved in identifying the outbreak in Lyndonville, New York, of what was known at the time as Chronic Epstein-Barr Virus (now more commonly referred to as Chronic Fatigue Syndrome or CFS). When Dr. Bell was interviewed about the outbreak in a 1996 Prime Time Live episode, the reporter described his appeal to the Centers for Disease Control and Prevention (CDC) for help with the illness, but he says the CDC didn't mention a similar outbreak in Lake Tahoe, which he learned about later. Dr. Bell wrote The Doctor's Guide to Chronic Fatigue Syndrome, which was published in 1995. The book, which also refers to CFS as "chronic fatigue immune dysfunction syndrome," or CFIDS, describes Bell's CFIDS disability scale. Various publications have used or proposed Bell's scale which is similar to the Karnofsky scale, for the documentation of severity of symptoms in CFS. Hillary Johnson's 1996 book, Osler's Web, chronicled much of Dr. Bell's clinical efforts during the Lyndonville outbreak. In 2000, the CFS documentary, I Remember Me, Dr. Bell appeared in an interview recounting his experiences during the outbreak. In 2000, Dr. Bell wrote The Faces of CFS, which was a compilation of real patient case histories from those who have this disease. One particular patient that Dr. Bell wrote about was Maggie. In her chapter Dr. Bell wrote "Her body felt leaden, and curiously toxic; she felt a certain kinship with Chernobyl’s radiation sickness victims." In the Fall of 2003, the Secretary of Health and Human Services, Tommy G. Thompson, designated David S. Bell, MD as chairperson of the Chronic Fatigue Syndrome Advisory Committee, hearafter known as the CFSAC . Secretary Thompson stated that "Chronic Fatigue Syndrome can be a serious, debilitating condition. The work of this valuable advisory committee will help us raise awareness among the general public and health care professionals to better serve those affected by this condition." According to the U.S. Department of Health and Human Services website, the "CFSAC will provide expert advice and recommendations to the Secretary on topics including the epidemiology and risk factors relating to chronic fatigue syndrome (CFS) and diagnosis and treatment methods for the condition. The advisory committee is also charged with advising on the development and implementation of programs to inform the public; health care professionals; and the biomedical, academic, and research communities about advances related to CFS. This committee was formerly known as the Chronic Fatigue Syndrome Coordinating Committee." The website further states, "David S. Bell, M.D., FAAP, a physician from Lyndonville, New York will chair the CFSAC. Dr. Bell has conducted extensive clinical research on chronic fatigue syndrome. He has also conducted pediatric evaluations and research on this syndrome in children and published articles about the effects of CFS...CFSAC consists of 11 members. Seven of the members are biomedical research scientists with expertise in biomedical research applicable to CFS. The other four members are individuals with expertise in health care delivery, private health care services, or organizations concerned with the problems of individuals with CFS." The inaugural meeting for the CFSAC took place on September 29, 2003 . Dr. David S. Bell, chaired this federal committee through and including the meeting on September 12, 2005 (6th meeting). Asaf Durakovic, MD, PhD, DSc., is the Medical Research Director for the Uranium Medical Research Center (UMRC) in Toronto, Canada. The UMRC was founded in 1997 to provide objective and expert scientific and medical research into the effects of uranium, transuranium elements and radionuclides produced by the process of uranium decay and fission . Dr. Durakovic has numerous publications* on the use of depleted uranium (DU) in military operations and its adverse after effects. The NCF is most familiar with one of Dr. Durakovic's outstanding papers titled "Undiagnosed illnesses and radioactive warfare"* published in 2003 . With regards to Gulf War disease, in this paper Dr. Durakovic states "The symptoms of this progressive disease have been as numerous as their names, including incapacitating fatigue, musculoskeletal and joint pains, headaches, neuropsychiatric disorders, affect changes, confusion, visual problems, changes of gait, loss of memory, lymphadenopathies, respiratory impairment, impotence, urinary tract morphological and functional alterations. The disease was underestimated and subsequently evolved in its clinical description through recognition of progressive symptomatology. Sometimes dismissed as “malingering”, it passed through stages of being called a variant of chronic fatigue immune disorder, post-traumatic stress disorder, to its current acceptance by some countries and still not being recognized as a separate disease entity in others." 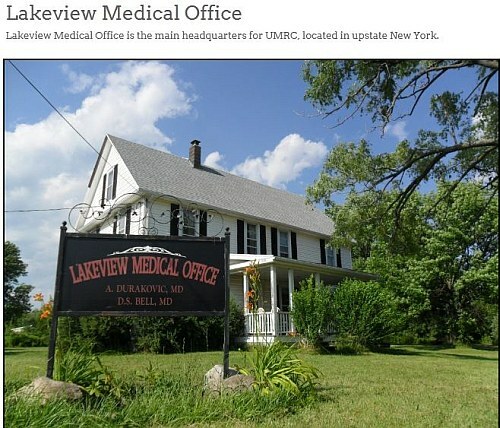 Dr. Asaf Durakovic and Dr. David S. Bell share a medical office, the Lakeview Medical Office, in Waterport, NY. Waterport is a town only eight miles from Lyndonville, NY . Since these two work together, they obviously share their medical interests and information. This is further fortified and exemplified by one additional relationship. David E. Bell works with Dr. Durakovic also: David Elijah Bell is the son of David S. Bell, MD. His background and work is highly important to CFS due to its relationship with radiation . David E. Bell is a Research Consultant in Epidemiology and Public Health for the Uranium Medical Research Center. As such, he also works directly with Dr. Durakovic! David E. Bell earned his BS degree from Vanderbilt University in 2003; his MPH and MA from Case Western Reserve University in 2006; and currently is a PhD candidate at the State University of New York at Buffalo. According to UMRC's website "David Elijah Bell is a medical anthropologist who specializes in international public health, environmental contamination, low-dose irradiation, and controversial epidemiology. His ongoing research includes degree of attributable illness from depleted uranium exposure in Gulf War Syndrome, and the role of low-dose irradiation in experiences of Chronic Fatigue Syndrome. He is interested in both genomic aberration and oxidative stress associated with the formation of free radicals. Sociocultural research examines the sociopolitics of contamination and the anxiety of uncertain or controversial illness, emphasizing that such anxiety will have both cultural and biological effects significant enough to alter the clinical expression of disease. David's public health background is in emergency preparedness and disaster relief. He has been a volunteer researcher at UMRC since 2004. He has worked with American Gulf War veterans and residents of industrial contamination sites in the Buffalo/Niagara NY region. His field research abroad has included multiple trips to Bosnia/Herzegovina as well as experience with Afghan refugees in Pakistan and experience with Iraqi refugees in Syria." Dr. Asaf Durakovic is also the Founder and Director of the World Life Institute . It was founded in 1987 and it also has an office in Waterport, NY. According to their website, "The personnel of World Life Institute are dedicated to the alleviation of suffering and restoration of the human spirit throughout the world, without regard to race, creed, color, religion, or national origin." Since it is apparent that David S. Bell, MD and his son David E. Bell have had a working relationship with Asaf Durakovic, MD, PhD, DSc for some time - this includes the time period when David S. Bell, MD was Chair of the federally appointed CFSAC committee. Why wasn't this critical information regarding CFS and its profound relationship to ionizing radiation brought before this federal committee? If you truly wish to alleviate the human suffering of millions of people around this planet that have this horrible disease, isn't it logical to first begin with a formal admission that such a scientific relationship potentially exists and that a request for additional scientific research in this area needs to be pursued? Whether there is political or governmental fallout or pressure is not the question here. The question is one of absolute truth and this scientific truth must be pursued. Irrespective of what others have apparently known, the NCF will continue to follow this science because this is the only way patients can ultimately obtain appropriate treatments to greatly improve their quality of life and to alleviate their human suffering. In August of 2010, the NCF issued a formal press release announcing a link between CFIDS/ME and low level radiation exposure . As patients ourselves, we have climbed a very tall mountain to get to this point. Internalized radiation particles can certainly produce chronic radiation injury. Radiation poisoning is a very tall order due to its scientific complexity and damage potential but at this point we simply have no choice, we cannot turn and walk away. We must have the fortitude and courage to continue our assent for answers. Please help us help you by continuing to support us in any manner possible.